Oscar De La Hoya the promoter has a job to do – pump up the fighters in his stable the best he can. 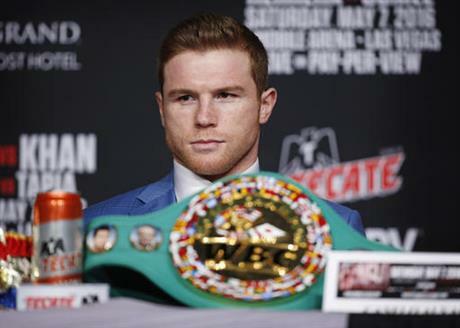 Still, some of his comments Monday regarding Canelo Alvarez were somewhat mystifying. Alvarez on Sept. 17 will challenge Liam Smith of England for his junior middleweight title at AT&T Stadium in Arlington, Texas (on HBO pay-per-view). Alvarez (47-1-1, 33 KOs) could have instead fought middleweight champion Gennady Golovkin in a title-unification bout that would have definitely drawn enormous worldwide interest. Rather, Alvarez vacated his middleweight title. Then Alvarez and De La Hoya announced they won’t consider fighting Golovkin until September 2017 at the earliest. he become one of the best in the rich history of Mexican boxing? De La Hoya responded in what seem to be hyperbolic tones. “Mexican fighters have long been known for their toughness, their ability to walk through fire, their willingness to take three punches to land a solid shot,” De La Hoya said. “That is Canelo Alvarez. De La Hoya didn’t stop there. on two things – being the best fighter in the world and putting on a show for the fans,” he said. “And that’s what Canelo will continue to do for the rest of his career. Well, I just saw a message board that contained nearly 90 comments. The subject was, has a fighter from Mexico ever given up a world title to avoid fighting someone? Frankly, I don’t know if that has happened before. But it was obvious from the amount of negative comments toward Alvarez, that he is not quite the darling of boxing fans worldwide De La Hoya suggets. It’s difficult to overcome something that happens in the sequence this did. Alvarez after he knocked out Amir Khan in May declared himself ready and willing to fight Golovkin this fall at 160 pounds. To say he was adamant, would be putting it mildly. Next thing we know, he’s giving up his belt and saying he won’t fight Golovkin for quite some time. I’m not sure if De La Hoya understands what that kind of flip-flop can do to a fighter’s reputation. Alvarez is a good man. Clean-cut, the whole ball of wax. But until he fights Golovkin, he’s going to have this hanging over his head. 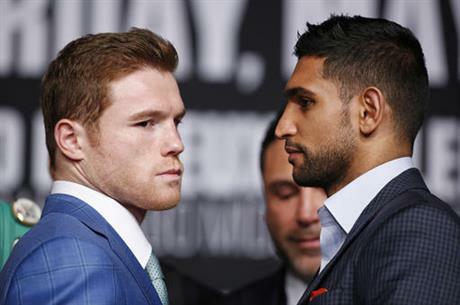 Canelo Alvarez and his promoter – Oscar De La Hoya – on Wednesday played host to a conference call promoting Alvarez’s fight against junior middleweight champion Liam Smith (23-0-1, 13 KOs) of England on Sept. 17 at AT&T Stadium in Arlington, Texas (on HBO pay-per-view). But Alvarez (47-1-1, 33 KOs) and De La Hoya found themselves still defending the decision to have Alvarez gave up his middleweight title rather than meet middleweight champion Gennady Golovkin this fall. Alvarez and De La Hoya also previously said they now won’t consider Golovkin until September 2017. Alvarez shrugged off the negativity. “Yeah, you know, there’s always going to be critics,” he said. “They’re always there, and it’s something that’s part of it. It’s part of the business. Obviously, there’s good critics sometimes and there’s bad critics. De La Hoya said it was all about Alvarez not being ready to fight at the full middleweight limit of 160 pounds. When he fought in the middleweight division, it was at a catch-weight of 155, just one pound over junior middleweight. Kell Brook holds one of the welterweight title belts, but he is a big welterweight and he believes there will be no weight advantage for Gennady Golovkin when the two square off Sept. 10 for Golovkin’s middleweight titles at O2 Arena in London (on HBO). The interested parties gathered Monday at a news conference in London. Brook made sure everyone knew he won’t be the smaller man in the ring come fight time. According to one source who requested anonymity, Brook was walking around at 178 pounds at the July 14 news conference in New York City promoting this fight. And he was not fat. The welterweight limit is 147, middleweight is 160. Golovkin spoke as if he knows he won’t have a cake walk. Roman “Chocolatito” Gonzalez of Nicaragua on Sept. 10 will move up in weight to challenge Carlos Cuadras of Mexico for his super flyweight title at the Fabulous Forum in Inglewood (on HBO). Gonzalez (45-0, 38 KOs) is considered by some to be the top pound-for-pound fighter in the world. He has won world titles at minimumweight, light flyweight and flyweight. Cuadras will be looking to make the 10th successful defense of the belt he won in September 2012. He’ll have his hands full, and he seems to know that.